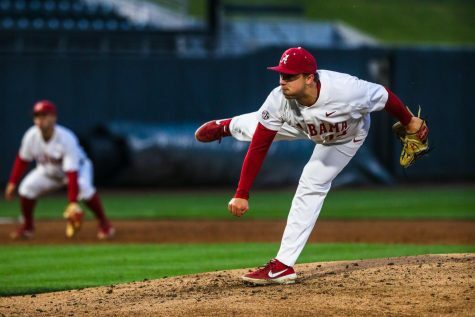 Alabama baseball fell to Arkansas on Sunday, losing its seventh SEC series in a row dating back to last year. 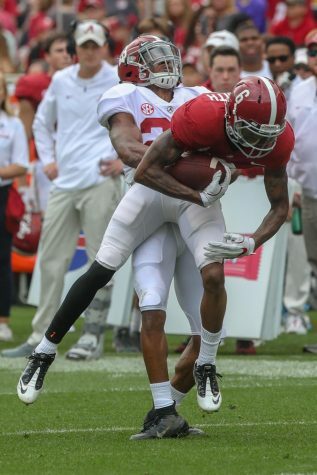 Overall, the Razorbacks outscored the Crimson Tide 22-15. 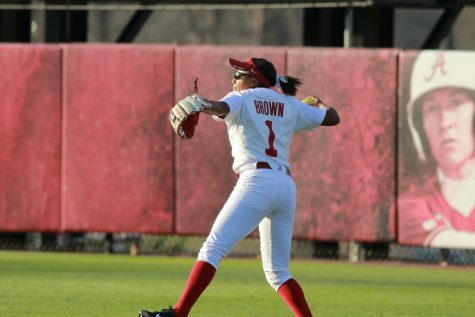 The series was a bookend for the Crimson Tide, as it lost the Friday game 12-3 and Sunday’s game 10-2, but won 10-0 Saturday. Arkansas started the game with a solo home run in the first inning from reigning SEC Freshman of the Year Heston Kjerstad. The Razorbacks added six runs in the second inning. With two outs and runners on the corners, the Razorbacks had a single to score a run. Following a hit-by-pitch to load the bases, Kjerstad singled to left-center field to clear the bases. Arkansas added two more runs after a double by Trevor Ezell, which scored Kjerstad, and a single to score Ezell. Starter Sam Finnerty started and lasted just four innings. He allowed eight runs, seven earned, while striking out five. 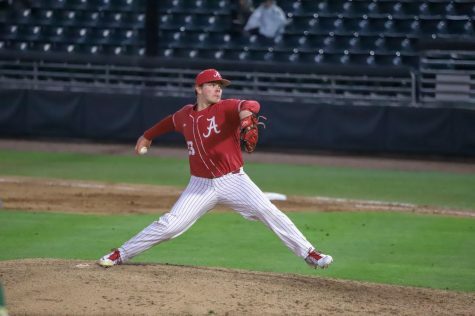 Junior Casey Cobb came up big for Alabama, as he threw four innings. He allowed two runs off three hits while striking out six. 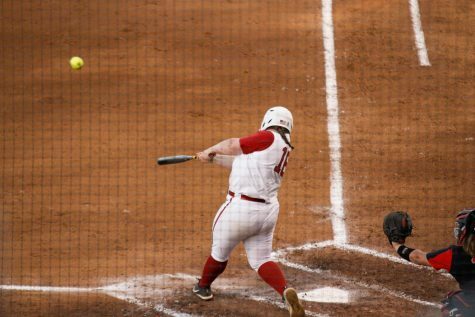 Alabama’s offense struggled to string together hits, as it got just five hits through the first seven innings, but it pushed across three runs in the ninth inning. After two walks and a hit, Alabama had the bases loaded. Kolby Robinson hit a grounder to second but beat out the throw to first, scoring the first run. Alabama scored the second run because of a wild pitch, then scored the final run on a double by Johnny Hawk. Keith Holcombe, who came into the game with a 36 game on-base streak dating back to last season, failed to reach base. He finished 0-for-3 with a pair of strikeouts. Saturday was a different story all the way around. Alabama blanked Arkansas for the first time since 2013 with its 10-0 win. The damage started in the second inning, where the Crimson Tide scored three runs. 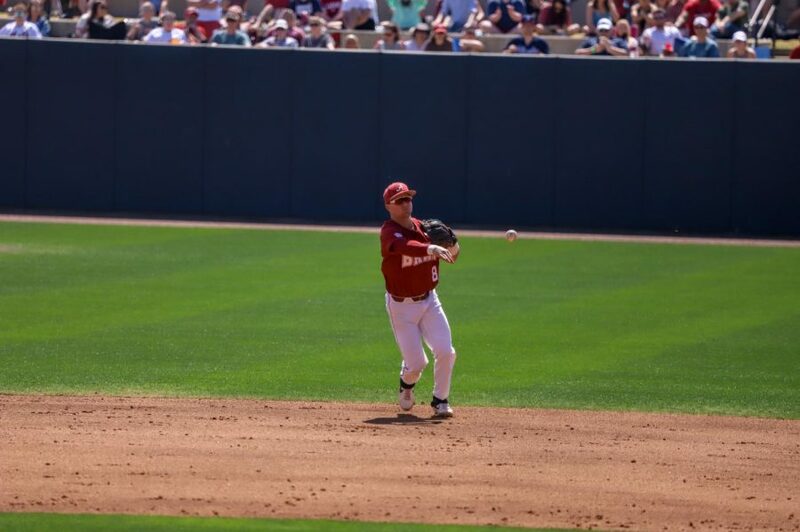 Holcombe started the inning with a home run to left field, and after getting two outs, the Crimson Tide loaded the bases for Robinson, who hit a hard ground ball to third base. The ball took a sharp hop and went into left field, scoring the other two runs. The Crimson Tide added six more runs in the sixth. The inning started with a single and a double. Catcher Brett Auerbach singled through the drawn-in infield to score both runners. From there, Arkansas made a pitching change. It brought in Patrick Wicklander, who threw just 16 pitches. Of those 16 pitches, only four were strikes as he walked the three batters he faced. Two of the three walks translated to runs. 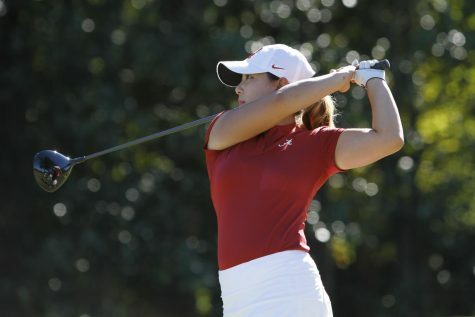 In Friday’s game, Alabama struck out eight times and walked just three times. 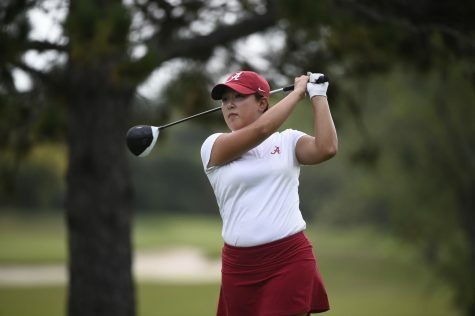 On Saturday, the Crimson Tide drew seven walks and struck out twice. Brock Love started on the mound and had a bounce-back game. The redshirt junior threw 5 1/3 innings and allowed just two hits and three walks. 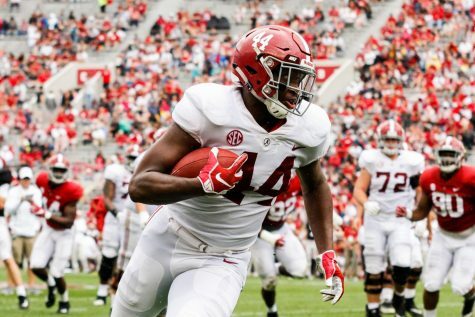 Game three mirrored game one for Alabama, as it allowed double-digit runs for the third time this season. 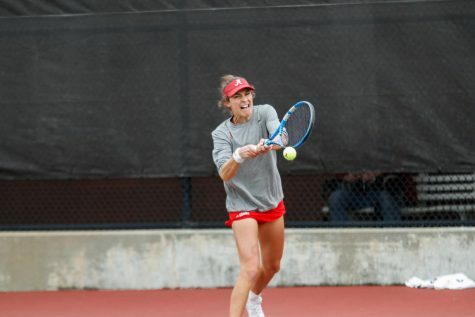 The 10-2 loss was its fourth SEC loss of the season and resulted in the series loss. Just as it did in the first game, Arkansas struck in the top of the first. This time it was Casey Martin, who hit the second pitch of the day over the left-field wall for a solo home run. The Razorbacks scored its second run of the game when Casey Opitz bounced into a double play with the bases loaded. Arkansas added another pair of runs in the third. The Razorbacks started the inning with a single and a double. With two runners in scoring position, Dominic Fletcher grounded out to second, scoring a run. Opitz scored the other run of the inning on a sacrifice bunt. The Razorbacks added four runs in the sixth and two runs in the eighth to cap its scoring at 10. 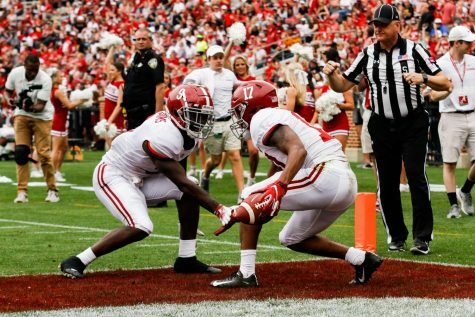 Alabama only scored in the fourth on Sunday. Tyler Gentry reached on an error to lead off the inning. He moved to third on a TJ Reeves single. Gentry scored on a sacrifice fly. Reeves advanced to third after stealing second and moving up on an error by the second baseman. He scored on a wild pitch. Wil Freeman started and lasted just two innings. Overall, Alabama used seven pitchers to throw the game.